What is the Import / Export Tool? The import/export tool allows you to transfer information between Method and a spreadsheet. This is particularly useful for users who want to import large lists of leads when first signing up to Method. The tool can also be used to mass-update existing information without having to do so manually. Best of all, you can use the import/export tool with Method tables, QuickBooks tables, and even custom tables you’ve built yourself! In order to be able to import, there are a few requirements. There are only two types of files you can import. Your import file must be of file type .csv or an .xsl Excel file. Unfortunately, you cannot use .xlsx files at this time. Administrative permissions is required for import and export. API permissions is required for import and export. To grant a user access to the Import / Export tool, please see our article Giving Access to the Import / Export Tool. 1. In the upper right corner, navigate through: Gear icon > Preferences > Integrations. 2. Click Launch Import / Export. This will take you to step 1 of the Import / Export menu. 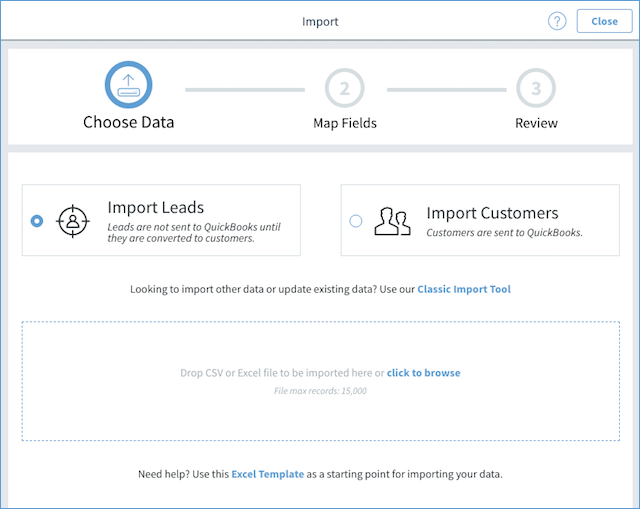 Now you can check out Importing Leads and Customers or Exporting Leads and Customers. The current import wizard only allows you to import leads and customers. If you wish to export data, or import into other tables, you will need to use our Classic Import tool. 3. Click the link Classic Import Tool.